This entry was posted in Baking, Chocolate, Photos, Sweets by Annie. Bookmark the permalink. Ha! 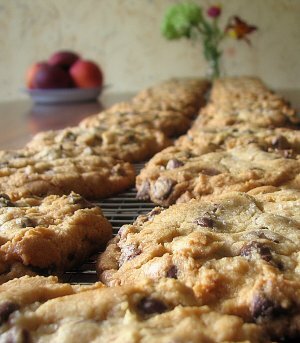 I bookmarked the NYT article and have been craving chocolate chip cookies since last week. 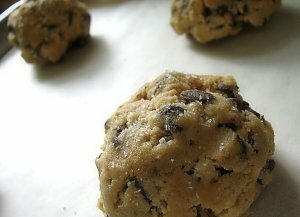 You’ve convinced me to definitely make them soon. Very soon! 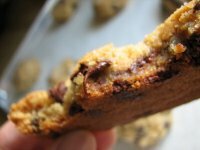 When I was in high school, I would always get a soft pretzel and jumbo chocolate chip chunk for lunch (I always looked forward to lunch time). I would rub most of the salt off of the pretzel and eat the pretzel, then eat the cookie, dipping parts of it into the reserved salt from the pretzel. Joelen: Hope to read about them soon! Melanie: I always knew you were a genius. PJ Hamel: You’re welcome! In my head, the entire staff at King Arthur is happy, jiggly, and round. I know it’s not true, but I like my fantasies as they are.